A little less than a year ago, we saw a report that showed the Galaxy Tab was the most popular Android tablet, followed closely by the Kindle Fire. A lot has happened since then. The Nexus 7 has rolled out and set the new bar for what a small, cheap Android tablet should be. So, what's changed worldwide? Well, according to Animoca, not much. 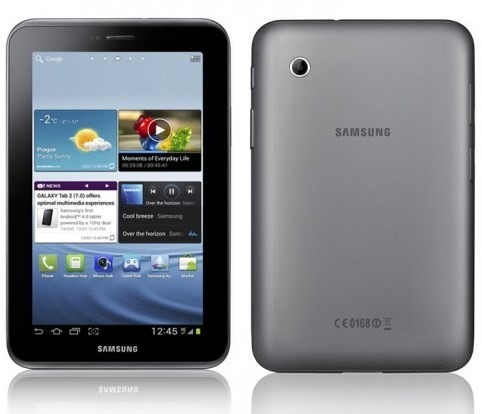 According to the firm—which distributes games and entertainment apps—the Galaxy Tab 2 7.0 is the top Android tablet with 11.8% of its network, followed closely by the 10.1 model of the same line. Following that is the Kindle Fire and the Kindle Fire HD which collectively make up another 12.4% of Animoca's users. All told, before we get to the fan-favorite Nexus 7, a whopping 37.3% of the market has already gone to Samsung and Amazon (the former of which has plenty more share with other, less popular devices). So, what's the deal? Those of us who live in the Nexus bubble would assume the Nexus 7 would be the most popular, right? Well, funny story. As of right now, Google's seven inch slate is available in just ten countries. Only five of those have the 3G variant available. Granted, this only examines Play Store availability, but the offerings are still pretty sparse. Meanwhile, the Kindle Fire and Kindle Fire HD are available in no fewer than fifteen countries. The original also came out about seven or eight months before the Nexus 7. To say nothing of Google's false start with peripheral Play Store services. While Mountain View has been pushing hard to bring content and devices to more countries, the fact remains that for much of its still very short life, the seven inch slate has been hard to get, and lacking key features in most of the world. Of course, Samsung's dominance should need no explanation. It's a global distributor of electronic everything and has the scale to mass produce a hundred variations of the same product. Google has a long way to go if it wants its Nexus devices to start having an impact on the global market. The Galaxy Nexus was popular with the Android faithful when it first came out, largely due to the advent of Ice Cream Sandwich, but since the Nexus 7 arrived, Google has come into its own as a device designer. As more and more people associate Android with "Galaxy," the imperative to create a distinction and at least some competition will only get stronger. It will be interesting to see what the market looks like in another year. Our series about the most common smartphones and their OS versions in each country generated numerous requests for specific data (yes, we’ll get to Europe soon!). One of the most frequent requests was to issue something on the tablet market. In this post we’ll break down the most popular tablets wordwide. You can check out our other posts describing individual Android smartphone markets: Hong Kong & India | Singapore | USA | Japan. One in four Americans now owns a tablet device, according to Pew Research, and analyst firm IDC reports that the worldwide tablet market grew more than 78% year-on-year in 2012. IDC predicts that 190 million tablets will be shipped in 2013, with a forecast 48.7% growth over last year. So with tablet sales not slowing down any time soon, let’s see which Android tablets are currently the most popular on the Animoca network of Android users. All data obtained from individual users of Animoca games worldwide who used Google Play and who played an Animoca game on a tablet device between February 18 and March 20, 2013. Immediately you’ll note that 4 of the top 5 tablets, and 6 out of the top 10, are of the smaller variety, featuring 7-inch screens. This should come as no surprise, given that one in every two tablets shipped last quarter had a screen size of less than 8 inches. Once again we note the prominence of Samsung devices; apparently, the Korea-based company dominates tablets as well as smartphones. Next up, the Amazon Kindle and Kindle HD account for more than 12% of the tablets on our network – quite remarkable for devices that are still not globally available. The popular and zippy Google Nexus 7 came in 6ᵗʰ place, suggesting that Google will be a significant player in the hardware wars. Once we account for Samsung, Amazon, and Google, the rest of the field is wide open. 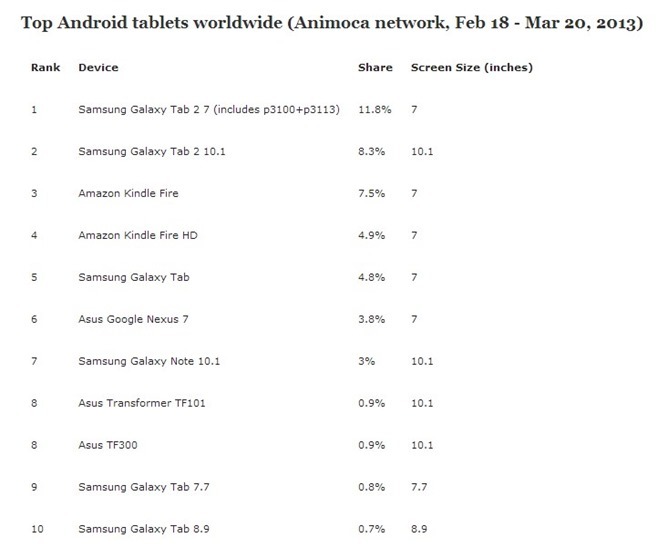 After the top 7 tablets, the devices claiming under 1% of the Animoca Android network became too numerous to list here. In fact, given an error margin of 0.1% and the slight differences between tablets in 8th place and onwards, we cannot be entirely sure of the correct ordering. What we can be confident of is that tablet sales won’t slow down any time soon, and that developers should be creating mobile apps built to suit their users. Knowing which tablet or tablets you are developing for is useful knowledge – not only screen size, but also other hardware specifications. When we looked at Japan we saw what seemed to be a preference for one-handed gaming on smartphones being used in portrait mode; perhaps the popularity of 7-inch tablets has something to do with a similar global trend. Of course, it could just be that the 7-inch tablets strike an ideal balance of price, portability, and form factor. Join us next time for more Animoca data, and be sure to follow us on Twitter for additional insights!